Please note that everyone should come in via the Special Events Entry (the former main gate inside the Park) which is closest to IPBCC. Directions to International Polar Bear Conservation Centre (IPBCC) located at the Assiniboine Park Zoo. The Manitoba Inuit Association (MIA) is holding our Annual General Meeting on Sunday, October 21, 2018 at 12:00 pm. On behalf of the board of directors, I am pleased to invite you to attend our AGM as a Member of MIA. Please come and add your voice to the future direction of our expanding organization. If you are 16 years of age or older, identify as being Inuit, and have lived in Manitoba for 3 months or longer, you are an "Active member" and are allowed to vote on all motions presented at the AGM. All other members are "Associate members" and are also invited to attend the AGM to discuss the organization's future. 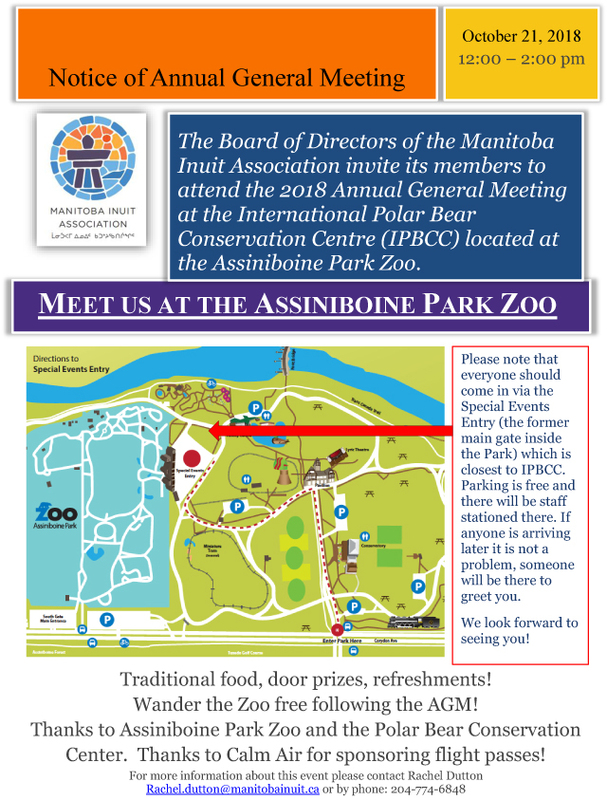 All attendees have free admission to the Assiniboine Park Zoo following the close of our AGM!!!! Traditional foods and entertainment as well as a draw for 2 free passes from Calm Air!! What: Approve Financial statements, review highlights from the past year, talk about next year, elect new board members. ** Active members are invited to vote for board of directors, approve the 2017-2018 financial statements. New Board Members needed - contact us by October 17th if you are interested in running! If you are an "active member" and are interested in running for the volunteer board, please send an email to rachel.dutton@manitobainuit.ca and we will contact you to follow up. Know others who should join MIA? Go online to submit MIA Membership application form at www.manitobainuit.ca. Please send in the membership by October 17th in order to participate in the October 21, 2018 AGM. Thank you for your interest in MIA and our activities! This promises to be an exciting year ahead! !